The advent of Reliance Jio has forced all the incumbent telecom operators in the country to offer more pocket-friendly plans, bringing high-speed internet to the masses like never before. However, even as Airtel, Vodafone and Idea are launching new plans and revamping old ones seemingly every other day, Jio continues to rule over the hearts and minds of consumers for its sheer value-for-money recharge plans, something that its rivals have so far failed to match. However, now that all the leading operators in the country are offering very similar recharge vouchers in terms of per-day data allocation, let’s compare their most affordable prepaid plans to see who gives you the most bang for your buck. Starting off with the biggest of them all, Airtel offers 1GB of 3G/4G data daily for 70 days for Rs. 399. The plan comes bundled with unlimited calls and 100 SMSes, whether local, national or roaming. Vodafone also offers an identical plan that brings the exact same benefits with the exact same validity at the exact same price-point. So you get 1GB of 3G/4G data every day alongside unlimited calls and 100 SMSes (local, national and roaming) for Rs. 399. Now the number four private telecom company in the country after being overtaken by Jio recently, the Kumar Mangalam Birla-led telco offers a 28-day recharge voucher that’s priced at Rs. 199, and brings 1GB of data per day alongside the standard unlimited calls and 100 SMSes per day. The company also offers a 70-day recharge voucher with similar offerings, but that costs Rs. 449. 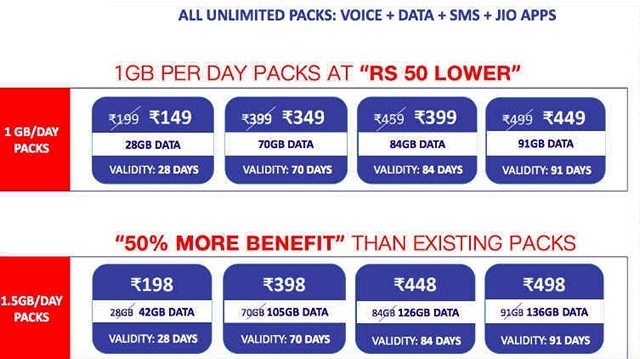 Last but definitely not the least, Jio offers 1.5GB of data daily alongside unlimited voice calls (local, national and roaming) and 100 SMSes for 70 days at Rs. 349 and 84 days at Rs. 399. However, with the various cashback offers, one ends up paying Rs. 50 less than the advertised MRP, which means, you’ll only have to pay Rs. 299 for a 70-day pack and Rs. 349 for an 84-day pack, both of which offer 50% more data than the plans from the other operators. It’s important to note here that unlike Jio, the plans of all other operators vary from one circle to another, so all plans may not be available everywhere. The aforementioned plans are all applicable to Delhi NCR, but in Kolkata, the Idea plan offers 1.4GB of data instead of just 1, although, only on 3G networks.